In my last post on Giving While Getting Out of Debt, I had mentioned that with God's help, our family paid off over $25,000 of consumer debt in 18 months. 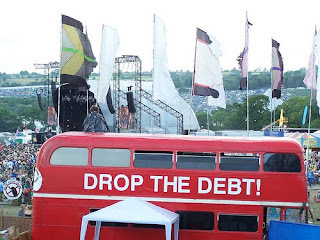 Since this statement seemed to spark some interest over the weekend, I thought it would be a good idea to review the step-by-step process that I took to get out of debt between October 2005 - June 2007. Inspiration. Before starting any great task, you need inspiration. For me it came in the form of a book called Financial Peace by Dave Ramsey. After I read Dave's book, I then got turned on to his radio program. Every time I heard someone call in to shout, "WE'RE DEBT FREE!" I became more and more determined that my family could do what all these people had done. I knew I could be just as weird as all of these people that were calling in! Determination. Having all the inspiration in the world will not get you out of debt. You have to make that final, determined decision that you are not going back to poor financial management. You will accept no other choices other than freedom from debt. Dave calls this gazelle intensity. We became determined to get out of our $25,000 of consumer debt as quickly as possible. Separation. The road to debt freedom began with a painful separation - the sale of our house. Once we made the decision to get out of debt, the biggest asset we had with some available cash to pay down half the debt was our home. For me, it was the best decision we made in the process. Not only were we able to pay off half of our debt with the equity in our house, but we also saved a little money each month by making slightly cheeper rent payments verses mortgage payments. Home ownership also has a way of draining your available cash-flow when you constantly have to make regular, routine repairs. I praise God that He gave us the direction to sell our house back in the fall of 2005 before the housing market went all to pieces! Perspiration. Next, came all the hard work - keeping a regular monthly budget, cash envelope system, extra jobs, and making accelerated debt payments to get out of debt as fast as possible. On June 15, 2007, I mailed in our final payment to the bank on a personal loan. Celebration. We did it! With God's help and plain old hard work, we were able to accomplish what all these other Dave Ramsey fans were able to do. We attained financial peace! Continuation. Being debt free is a never-ending process. It takes vigilance and persistence. Once you get out of debt, it's really easy to fall back into it if you get sloppy with your finances, again, or worse yet, get "stuffitis!" You have to maintain the disciplined work (budget, cash envelope system, etc.) that helped get you out of debt in the first place. The great news is that this disciplined work gets easier over time. The majority of my bills are now automated, and I probably spend about 45 - 60 minutes on the monthly budget. To me, this is time well spent to stay debt free. Have you become debt free or are you in the process of becoming debt free? What inspired you to pursue a debt free lifestyle? What has been the hardest part of getting out of debt? I am a huge fan of Dave Ramsey! Reading his book and the success stories helps to keep us motivated. This month, we are paying off our car payment, and hopefully within 6 months we will have our credit card balance paid off! Hey, Christina - me too! I'm not only the stewardship pastor of my church, but I'm also the head Financial Peace University coordinator. Dave rocks on so many levels. Keep working that debt snowball! Have you become debt free or are you in the process of becoming debt free? I am in the process of becoming debt free. I have paid off $57,000 in the past two years. I have another $22,000 to go. What inspired you to pursue a debt free lifestyle? I am also a huge fan of Dave Ramsey and he has been a great inspiration to me. What has been the hardest part of getting out of debt? Being frugal and staying out of the stores. I love to shop.